Ave Maria is a depiction of one of the first aircraft that Russell ever fell in love with. 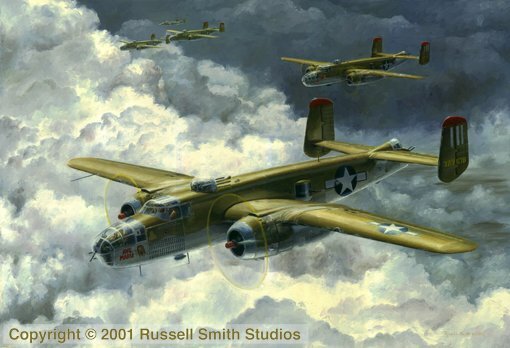 The B-25 Mitchell was a twin engine medium bomber developed by the North American design team just prior to WW2. The Mitchell is perhaps best remembered as the aircraft used by the Doolitle Raiders on their historic raid on Japan. This particular aircraft was a B-25J assigned to the 321st Bomb Group based in southern Italy during the later stages of the war.